Four years ago today, Washington agreed to send three first-round picks and a second-rounder to St. Louis for the right to move up to draft Robert Griffin III. Today, Griffin is a free agent, and the man the Skins selected on the third day of that draft is their QB and set to make $20 million. Cooley, comfortably ensconced in his second career as “Guy Who’s Always on the Radio and Often Saying Bad Things About RGIII,” spent most of Monday going on the radio and saying bad things about RGIII. Dan Steinberg, the Washington Post’s Guy Who Transcribes Cooley Saying Bad Things About RGIII, has written up this latest round, and it’s all really, really good and you should go read it. In the meantime I’ll just be Guy Who Aggregates Steinberg Transcribing Cooley Saying Bad Things About RGIII. “Robert never took [responsibility] for that,” Cooley said. “Robert continued to let his offensive line eat the blame. They don’t like it. They hate that, man. That kills them. Perception is the only thing an offensive line has, because 99 percent of people watching football have no idea what an offensive line’s doing. Oh yeah, that’s the good stuff, hook it directly to my vein. There’s seriously a whole lot here, especially on Griffin’s frosty relationship with Cousins. 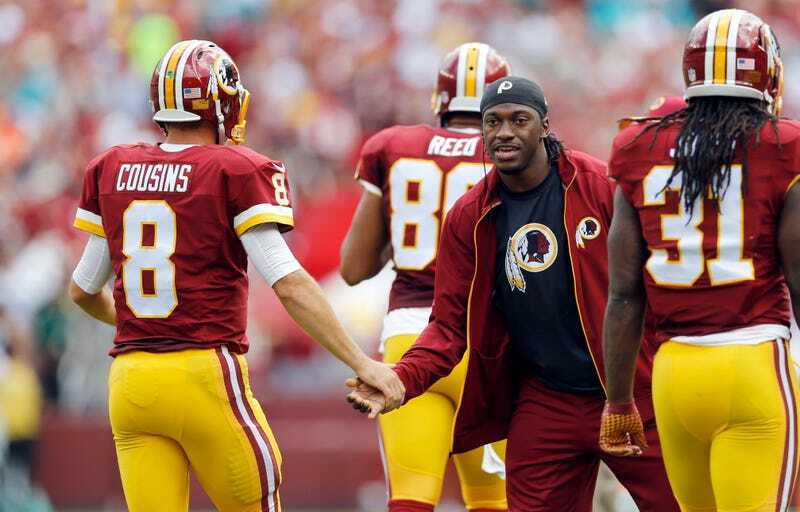 You get the feeling Cooley’s been saving up for the first day RGIII was officially off the team.